Each month, I love to create a new sensory bin for my 3 year old son, Onetime. With Halloween over, and a recent early snowfall, I started to think about a winter-themed bin that we could make. After picking up a few supplies at the local dollar store, I had a hard time deciding what kind of bin to make and instead came up with 4 different ideas! To support my son’s recent explosion of interest in letters and numbers, I created some fun ways to make these bins more than just fun – but educational too (of course!). *This post contains Amazon Affiliates Links for your convenience. Please see our full Disclosure Policy here. Although each of these bins has different supplies and different possibilities for play/learning, many of the materials are the same. Here is the basic supply list that you will need for all 4 bins. You will find a more detailed supply list under the description for each bin. 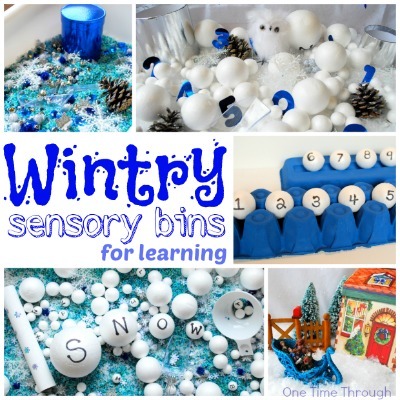 Onetime really enjoyed playing with this sensory bin – especially because it has so many different textures. The softness of the pompoms and large snowflakes contrasts nicely with the hardness of the marbles, gems and rice. He also enjoyed playing with the bells! Special Supplies: a variety of white, blue, and silver “wintry” decorative objects from the dollar store. We used snowflake ornaments, pompoms, bells, marbles, fake gems, a sparkly sleigh, and real pinecones. Warning: If your child is still mouthing different objects, avoid using the marbles and gems which may be easily swallowed. This kind of bin is perfect for dumping and pouring practise for little hands (great beginnings to understanding volume and capacity). Kids will also spontaneously start to hide and re-discover little buried treasures. You can also enrich the learning by encouraging your child to sort the different treasures by size, or colour (beginning those patterning skills) into the different containers. Have fun finding and counting different materials as well with older children. Onetime is really into counting right now – so this bin was right up his alley! He enjoyed finding all the hidden numbers from 1 to 10, and putting them into order. Special Supplies: a variety of different sized foam balls, an egg carton cut in half for holding number balls in order, cutout numbers from 1 to 10 (or higher if you like), a variety of white and silver objects (optional) – we used snowflake ornaments, snowflakes, silver bells, silvery pinecones, and fake diamonds. We also put some blue lights around the border of the bin. They looked nice, but ended up being more a distraction than anything! 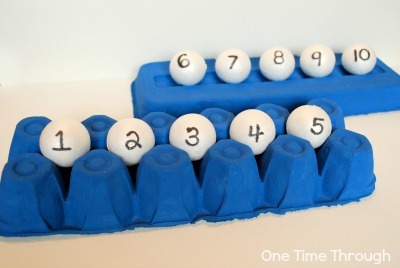 Preparation: Using a permanent marker, write the numbers from 1 to 10 on the sides of 10 foam balls. If you like, you can also make sure there is the matching number of things for each number in the bin. We placed one snowy owl in the bin, two silver containers, three pinecones, four large snowflakes etc. Kids can look for the cut out numbers from one to 10 and practise putting them in order. 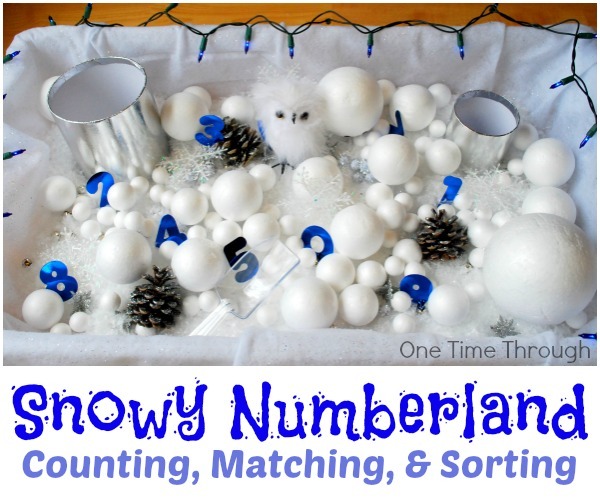 Kids can also search to find the foam ball numbers from 1 to 10, put these in order, and even match them to the number cut-outs. If you place matching numbers of objects in the bin, kids can practise pulling out a number and then finding the matching number of objects. Foam balls can be sorted into containers based on size. They can also be placed in order from biggest to smallest, or smallest to biggest. Just think of all the math possibilities! Onetime has learned a number of the sounds of the letters of the alphabet and recently started recognizing simple words like “on” and “off” and his name. To continue supporting and extending this learning, I created this open-ended “spelling” snowball bin. Special Supplies: a variety of sizes of foam balls, a cardboard paper towel tube, an egg carton cut in half, a large funnel (optional), a variety of decorative snowflake/white items. 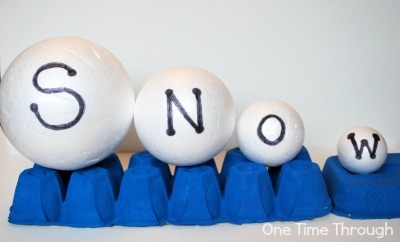 Preparation: Write the letters of the alphabet on the smallest foam balls. You can make multiples of vowels and highly used letters if you like. We wrote the words SNOW on four balls that got successively smaller. 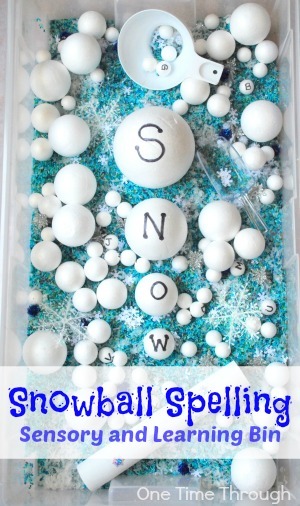 Help your child find the letters for the word SNOW and place them in order on the egg carton holder. Emphasize the sounds of each letter as you make the word. Also – you can show your child how to rearrange the letters of the word snow to make NO, ON, SON, WON, and NOW! Onetime LOVED this – and after we played with this sensory bin, wanted to know how everything was spelled all of a sudden! Ask you child what other words they would like to spell. Search for those letters and build them on the egg carton. Names of family members and friends and pets are highly motivating to start with! Or – if your child is just learning their letter names, allow them to free play with the bin, sorting balls, pouring rice through the tube, etc. If they show interest in the letters, name them, or tell them the sound and give them an example of a word that starts with that letter. 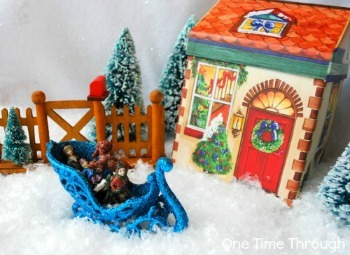 Special Supplies: a few little houses (if you don’t want to buy these, paint some tissue boxes), a toy sleigh or cars, a toy snowman, some fake trees/pinecones, little people or animal figurines, anything else you think would fit a wintry outdoor scene. 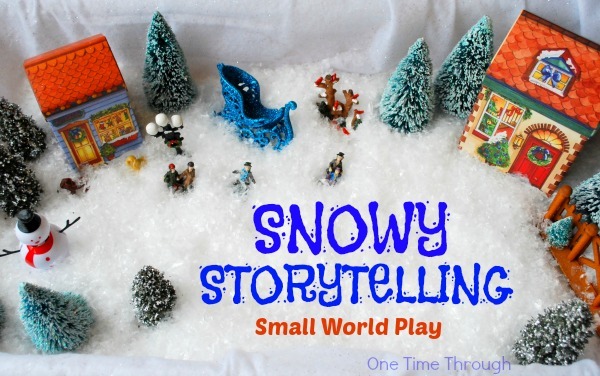 Preparation: Create a little scene amidst the snow and present it to your child! Onetime likes dogs, so I included a few plastic dog figurines as well as some people I found at the dollar store. The idea with a small world sensory bin is that it is open-ended and yet provides some prompts for imaginative play. If you play with your child, or if your child is playing with another child, it can be a fantastic opportunity for language development. After taking in the scene a bit, my son first grabbed the sleigh and began piling people and dogs in and taking them for rides through the snow. Characters began to get names and a little “story” unfurled as he played. Eventually, the toy shop became a place to visit and buy toys, while the little house became the characters’ home base. There was even some pretend play that centered around delivering mail when my son noticed the little gate with the mailbox. After playing in this small world, you could write the “story” down together in a little book, or even just tell each other the “story” again at bedtime. 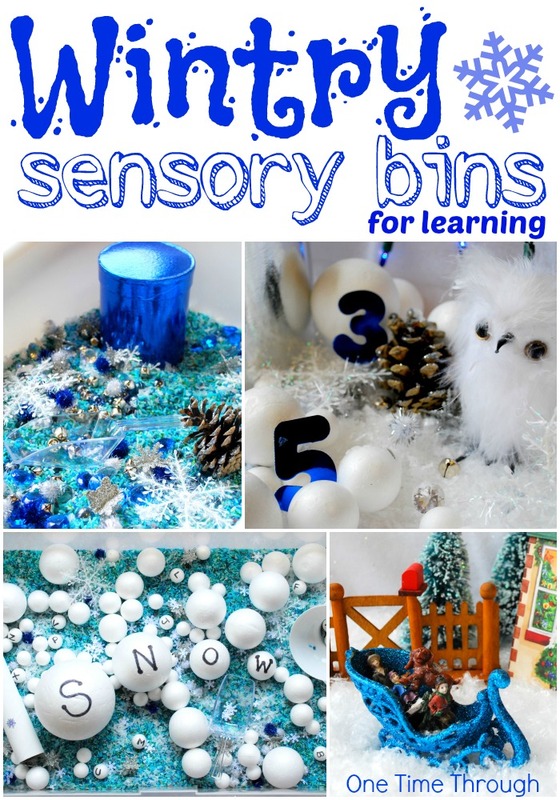 That’s it for our Wintry sensory bin ideas! 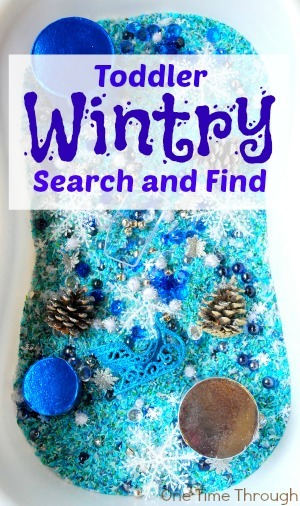 If you’re looking for other Wintry kids’ crafts and activities, be sure to follow our Pinterest board: Follow One Time Through’s board Winter Kids Crafts & Activities on Pinterest. To find even more fun and educational activities, as well as positive parenting tips, follow us on Facebook, Twitter, and Google+. So many great winter suggestions. Pinned to my “Sensory Experiences for Children” board.